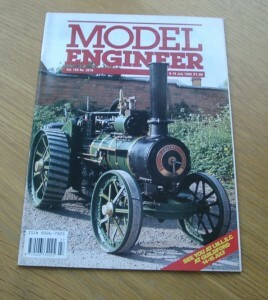 Vol 165 #3876 6th July 1990 of the British Magazine, Model Engineer. Features in this issue includes Re-engineering the Mamod locomotive (part 1), Vee Twin Engine – miniature motor cycle engine (part 3), Minicraft Mods – bowl turning lathe (part 6), Fire Engine and UXB Boilers – full-size and model (part 1), Green Arrow – 5 in. gauge V2 locomotive (part 24), Hydraulic Pumping Engine (part 2), Pickering Governors – for a realistic model (part 4), Borderer – twin cylinder marine steam engine (part 7) and Turbines on wheels – France (part 3).